Sataspes tagalica Boisduval, , in: Boisduval & Guenée, Hist. nat. Insectes (Spec. gén. Lépid. Hétérocères) 1: 378. 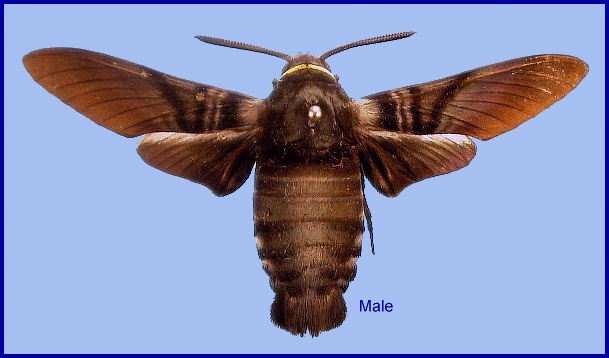 Type locality: Philippines, Bourias [Burias]. Synonym. Sataspes ventralis Butler, 1875. Synonym. Sataspes hauxwellii de Nicéville, 1900. Synonym. Sataspes tagalica collaris Rothschild & Jordan, 1903. Synonym. Sataspes tagalica thoracica Rothschild & Jordan, 1903. Synonym. 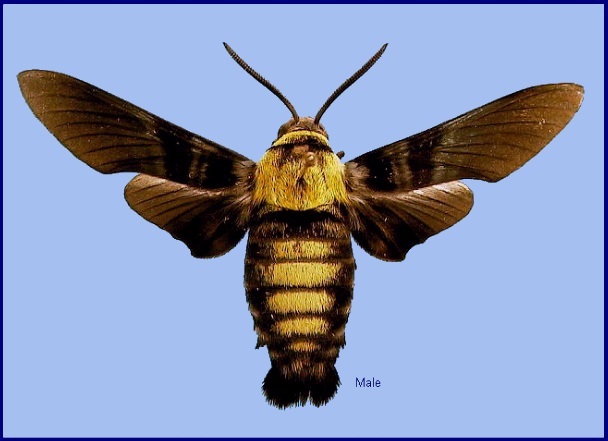 Sataspes tagalica chinensis Mell, 1922. Synonym. 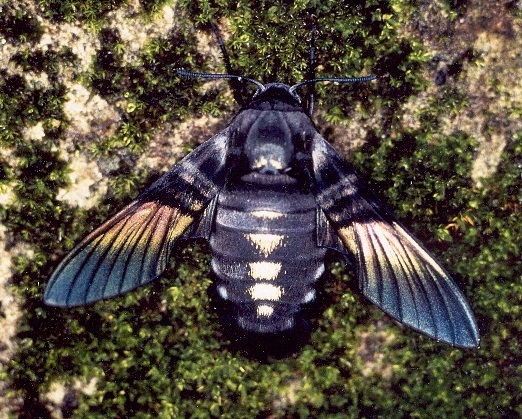 Sataspes tagalica protomelas (Seitz, 1929). Wingspan: 56--70mm. 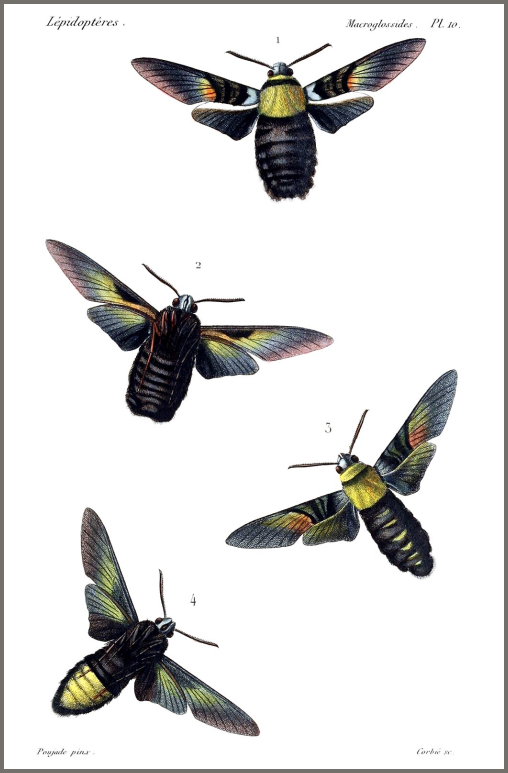 Variable, with several named forms, often from the same brood. 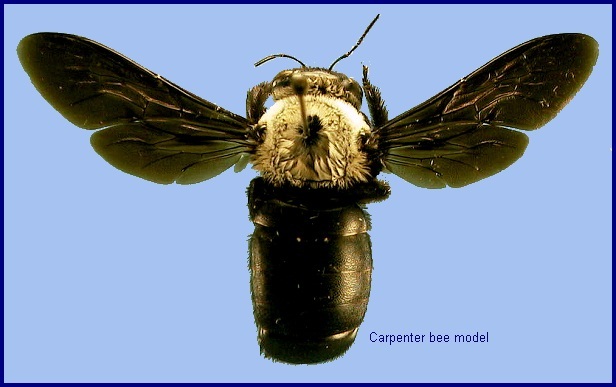 A mimic of large bees, particularly species of Xylocopa (carpenter bees), with male and female moths mimicking different species of bee. 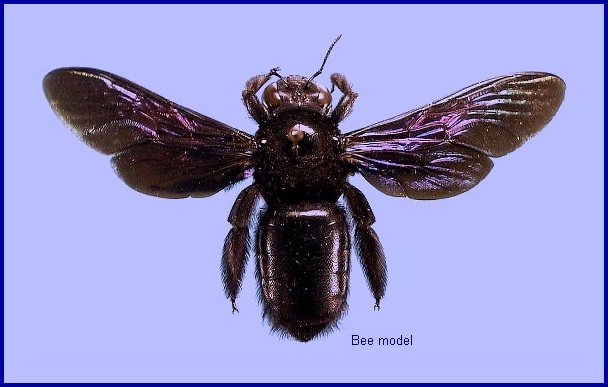 In the male, thorax upperside yellow in most individuals (but never in females), black mesially. Abdomen upperside with pale yellow dorsal patches (but never in females). Abdomen underside posterior sternites pale primrose-yellow. Forewing upperside disc and almost the entire hindwing with greenish iridescence. 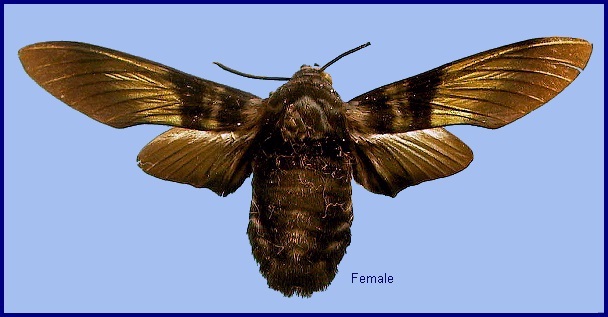 Forewing underside with yellow basal costal tuft. 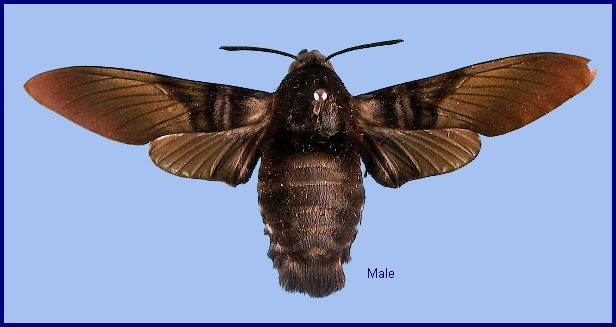 Hindwing underside with yellow basal costal tuft, some white scaling. In the male genitalia, uncus with the lobe spatulate, apex somewhat twisted, feebly truncate, inner angle slightly acuminate, a sharp tooth at upper edge of lobe. Clasper as in Sataspes infernalis, but tooth broader, lobe more rounded, plate smaller. 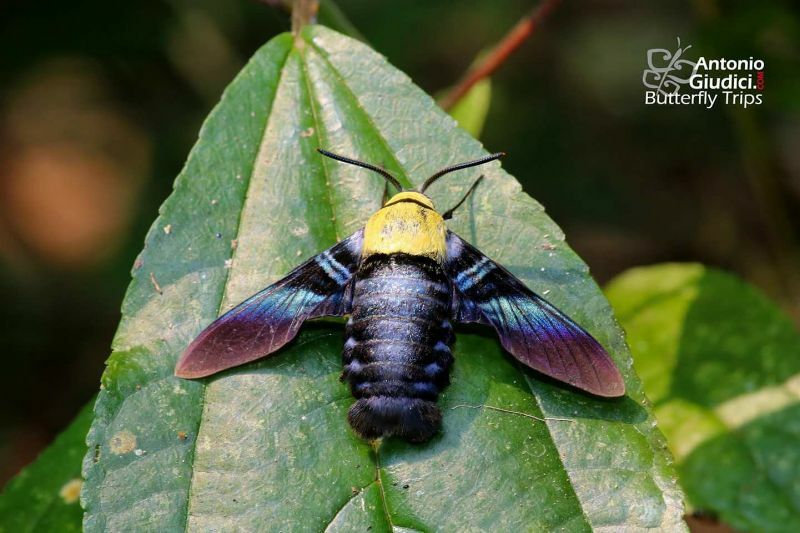 A day-flying moth attracted to the flowers of Duranta erecta and Lantana camara, usually from mid morning to early afternoon. A species of woodland margins and shady tracks through woodland, particularly near bodies of fresh water (Li, 1994). China: vii (Guangdong; Hong Kong); 20.viii (Hong Kong); ix (Guangdong). OVUM: Pale green, almost spherical (1.50 x 1.25 x 1.0mm). Hatches in about 4 days. Laid singly on the underside (sometimes topside) of leaflets towards the tip of overhanging branches, with most deposited between one and two metres from the ground. It is rare to find more than one egg per branch. Preference is shown for hostplants that grow together among trees that provide shade (Li, 1994). 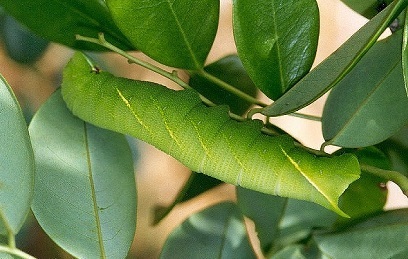 LARVA: Full-fed 40--65mm, width 9mm. The early stages have been well documented by Li (1994) from Hong Kong. According to Bell & Scott (1937), in the final instar closely resembling that of Sataspes infernalis, but differring in the face being green and rest of head whitish, while in Sataspes infernalis the face is pale green and rest of head darker green. 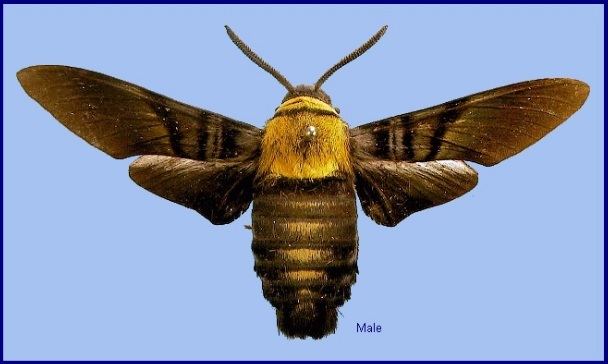 The oblique lateral stripes in Sataspes tagalica yellowish, those on segments 6 and 11 strongest; horn green dorsally, yellow laterally. 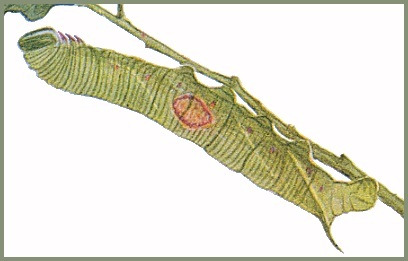 The larva becomes somewhat translucent in appearance before pupation, which takes place in a cell underground. The full life cycle takes about 45-51 days for males, about 58 days for females. 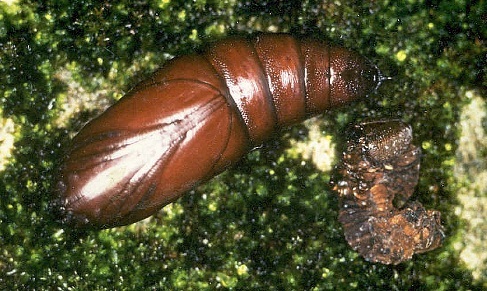 PUPA: 30--42mm, width 12.5mm. Very closely resembles that of Sataspes xylocoparis, the only noticeable difference being that in Sataspes tagalica the cremaster has lateral extensor ridges on the ventral surface, which run forwards to segment 11, and the cremaster ends in a simple point (Bell & Scott, 1937). Takes about 14 days to emerge. Larval hostplants. The woody climber Dalbergia benthamii (Fabaceae) in Hong Kong (Li, 1994). China: Hubei (Hefeng); Sichuan (Pengshui; Huili); Yunnan (Jinping; Xishuangbanna); south Xizang/Tibet (Mutu, Namjagbarwa region, 2000m (Wang, 1988); Bomi, 2000m); Hunan (Dayong; Henshan); Guangdong (Luofu Shan; Gunagzhou); Hong Kong (Tai Po Kau Nature Reserve; Aberdeen Reservoir); Hainan. Western and northeastern India, Nepal, Burma/Myanmar, eastern and southern China and Thailand.